Will Lenovo Mirage Camera (Google VR180) and Mirage Solo VR headset enable VR to succeed? 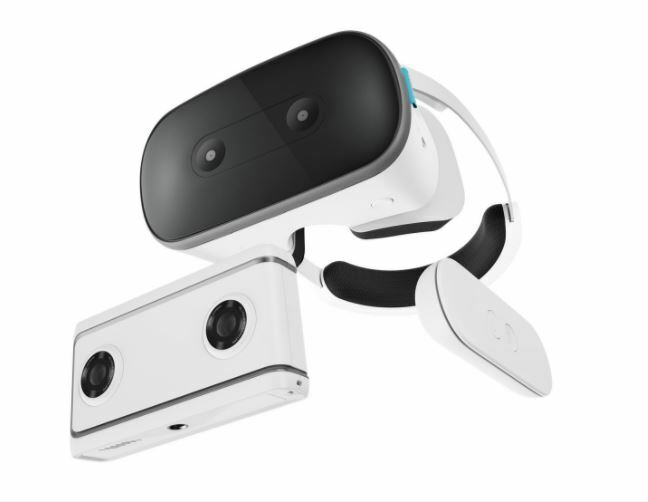 The first Google VR180 camera — the Lenovo Mirage — is launching on May 6, together with the Mirage Solo VR headset, a standalone Google Daydream 2.0 headset with 6DOF positional tracking, with no need for external sensors. Both are available for preorder. Here’s a detailed analysis of why they could enable VR to become mainstream. There is now more awareness about VR than ever, thanks to movies such as Ready Player One. However, in terms of ownership of VR headsets, they are still relatively uncommon. Even the most popular VR headsets, Samsung Gear VR and Sony Playstation VR, have not become smashing successes in terms of sales. No one knows for sure exactly why, but pundits have offered many reasons, such as not enough high quality content, or cost, or hardware requirements that are too steep, or that they are too inconvenient. In my opinion, the most important obstacle is that in order for VR to succeed, people must first come to want to use VR to capture their own photos and videos. Most people use smartphones to take photos or videos, and view them on smartphones, not because they offer higher image quality but simply due to convenience. Therefore the burden is on 360 cameras and VR headsets to show that they are so much better that people would actually prefer to use them even if smartphones are much more convenient for shooting and for viewing. This is where Google VR180 comes in. Let’s start with VR180 videos, which are not simply half of a 360 video. When a user views a Google VR180 on a smartphone or laptop, the video will appear as a non-360 4K video. But if the viewer views the same video on a VR headset (even Google Cardboard), the video becomes a 3D 180 video where they can look around. This is a clever way to emphasize to users the difference between conventional videos and VR videos. Most importantly, the video will look decent in terms of sheer image quality, unlike many consumer 360 cameras that look noticeably less detailed than conventional cameras. Here are samples from the Lenovo Mirage. The other part is of course the viewing experience. Right now, the most common way to view 360 videos in a VR headset is Google Cardboard. It’s cheap but it has several disadvantages. First, the tracking quality is not as good as it should be, often with significant ghosting and other issues, which is why it doesn’t feel immersive. Second, it’s not so convenient. You have to insert your phone (often, you’ll have to remove the phone from its case) and ensure that the phone is in the middle of the VR headset. Die hard VR fans won’t mind at all, but the challenge is to persuade average consumers. Here’s where Mirage Solo comes in. It’s a standalone device, so you don’t have to insert your phone or connect it to a PC. Second, its tracking is much better than Google Cardboard, and it even has 6DOF positional tracking, just like the HTC Vive (reviewed here) or Oculus Rift (reviewed here). Third, and just as important, it does not need any external sensors. Instead, it uses inside-out sensors to analyze its surroundings and determine how it is moving. The end result is a VR headset with no wires — one that you can wear immediately to experience ‘real’ VR instantly. For these reasons, Mirage Camera and Mirage Solo might be the answer for taking VR mainstream. But will they actually succeed? Here’s my analysis. I’m hopeful about Mirage Camera. The price is reasonable, and the camera is simple and easy to use for average consumers, not just in terms of its controls, but in terms of composition. I’ve shot with 3D 180 format, and to me it is much simpler to compose for it, compared to a 360 camera. In fact, you can pretty much shoot with it the same way you would with a smartphone. The missing link, however is to make it easy and convenient for consumers to view the videos they shot with Mirage Camera. So, how is Mirage Solo? Unfortunately, I cannot yet say that I’m super optimistic about the Mirage Solo headset for at least two reasons. First is price: $399 is not cheap, and in fact is just as expensive as Oculus Rift. True, it doesn’t need any cables, so it’s much more convenient. But the second issue is the quality of the VR experience. Although it does have positional tracking, the graphics on the ads and demos I’ve seen so far seem no better than current Daydream or Gear VR games, and a world of difference from Oculus Rift or HTC Vive. Moreover, its controller has much more limited tracking compared to the controllers on the Rift or Vive or even PSVR. It works by rendering only the portion that is visible to the viewer, rather than all the polygons of the 3D model. If Seurat can enable Mirage Solo to provide desktop-quality VR experiences, then I think it could impress consumers enough to take the dive into VR. Lenovo Mirage Camera and Mirage Solo headset are available for preorder from Amazon, either separately or as a bundle. Lenovo Mirage Camera is $299. Lenovo Mirage Solo is $399. If you order both as a bundle, you can save $50. I did order both myself and will post a review as soon as I receive them. Meanwhile, Yi Horizon, the other Google VR180 camera for consumers, has been reportedly pushed back to October 2018 (thanks to reader Francis for the tip!). camera users are used to framing shots. Can’t see how this Lenovo Mirage will get traction without one. Too bad the Yi 180 is pushed back to Fall. There is no need to frame the scene since VR180 cameras record everything that is in front of you. All you need is to point the camera in front of you. That’s why a digital display is not mandatory. The one thing I like about the Mirage over the Horizon is that it has a user replaceable battery whereas the Yi Horizon has a built-in one. Not the way that I shoot. I want to know what’s in and what’s out at the edges. Need that display. It’s not the same as framing in regular photography because when you look at the result via the headset, you only see what’s in front of you. And besides, only the subject matter at the front will be in full 3D. The problem with the Yi’s display is that it isn’t really showing you the full image you are recording, it is showing you what the result would look like as a 2D wide angle image – a very stretched and distorted one. The image it actually records is a square one but the one it shows you on its tiny display is rectangular. I would have preferred a larger display that shows both the left and the right image. I am not convinced that the tiny rectangular display on the Yi will be of much use other than to adjust settings. I agree. The ability to compose shots without a smartphone is a big selling point. I can get why 360 cameras cannot have a screen but 180 should. It will make them even easier to use. It’s simply not the same as a regular camera or phone because 180 lenses record absolutely everything in front and to the sides of you so you need only to point the camera in the direction of the subject and the entire scene that you see with your eyes will be recorded. In other words, the view of your eyes is likely to give you a better idea of what the camera is recording than a tiny display would. After watching a few 180VR videos recently using my cheapo “headset” I’m coming around to your way of thinking regarding not needing a viewer on the camera. Am looking forward to Mic’s review as well as reviews from other early adopters of the Mirage. Personally, I think I will just sit back and read the reviews and watch the test clips for a good while. I also want to see what LG will come up with and if companies like Insta360 will jump on the VR180 bandwagon before I make a decision. The thing that bothers me the most about the VR180 clips I have seen so far is the low effective resolution of the files they produce. They may be recording in 4K but the image is then stretched and magnified so much that it ends up looking like 240p when viewed in a headset. Hmmm…. when I view samples from Yi Horizon on my PC they look quite detailed. At least as good as Yi 360 VR, so better than 720p effective resolution. I don’t know about Mirage but I don’t think the effective resolution will be less than 480p. One thing I have learned from how previous 3D products were marketed in the past – notably, Fuji’s W3 – is that most people are notably ignorant of 3D. Yes, even with the number of 3D movies on the big screen, most people still don’t understand why such a camera have two lenses. They often assume that one is for wide shots and the other for tele or they assume one is a viewfinder. But they seldom grasp how a lens being a few millimeters away from another can produce 3D. However, most important, seeing such a camera does not evoke the excitement that it would in a 3D enthusiast. Therefore the presence of twin lenses is not a selling point. The proposed VR180 cameras otherwise look rather plain and the consumer is more likely to be attracted to a more sophisticated looking 2D compact with many more features than a plain plastic camera with two measly-looking fixed focal length lenses ! As for the VR headset, I use an economical all-in-one model with Android OS. It hardly cost more than a hundred bucks and works quite well. I find I end up using it so seldom that I wouldn’t consider paying four time that amount for something that is only marginally better. Yet I am a 3D and VR fan. So how likely is it that the average consumer will feel motivated to dish out four hundred bucks for a headset and another three-hundred for a dinky camera ? What I also found is that most people feel intimated by the large “diving mask” look of the headset and all that padding that ends up stuck on their face ! Finally, how is VR180 going to be marketed ? Is it going to be available in store ? Will people be given an opportunity to try it out ? Will they care to try it out ? And as for shooting one’s own content making a difference, I don’t see people racing to make their own movies because they saw a movie at the cinema. The truth is that most people are snapshooters and they just like to have pictures to put on social media or printed and put in albums. That’s why in spite of all the digital advancements, instant film cameras have a renewed popularity. 180 cameras have one advantage in that they shoot the entire scene in front and to the sides of us. However that is also their big shortcoming since the available pixels are spread over such a wide area. The other problem is that very wide angle field. Most people like to take pictures of friends and… selfies. What’s the point of using a fisheye lens to take a portrait ? I wish them best of luck, but finding ways to get people interested in VR180 is going to be quite a challenge. When it comes to VR I already have a Gear VR and an Oculus Rift. I see the Oculus Go as a better middle ground than the Mirage Solo for people getting into VR. That said this has a lot to do with devices like the Santa Cruze which are both stand-alone and have 6 DoF controllers. For someone like me, it makes more sense to wait for devices like that. If they make compelling software that uses the 6 DoF I can see the Mirage Solo take off. The Mirage camera is very tempting. It comes out before my biggest anime convention of the year (ACEN) but I want to hold out for the YI. I would love to create VR180 cosplay music videos but If I rush into it I’m sure the quality will suffer. After all, I have not done CMVs or VR180 so I’ll hold off for now. Good move on Lenovo for getting it out early. They are really tempting me! One thing you might keep in mind if you are shooting at cons is that the Mirage has a user replaceable battery so you can get spare batteries and not have to worry about running out of powe halfway through the day. I agree that the Yi Horizon “looks” fancier, but the current prototype they are showing has a built-in battery only. Therefore,unless they correct that before they release it, the Mirage may actually be a better choice for con use. Am I missing something. How am I suppose to view these vids in a mobile viewer/cardboard? What am I missing? Where’s the left/right eye? And what’s the point of putting on a headset to just view 180!? You see, Tim, Google’s “genial” idea for its VR180 standard is that the actual stereo pair is hidden when you view VR180 content on a computer monitor. This way, nobody will know that it’s actually a 3D 180 clip ! One can only see the clip in 3D 180 when played on a phone. The trick to that is that it displays in 2D in 720p and lower resolution but in 3D in 1080p and higher resolution. As to why watch in a headset in 180 ? Well, 180 is a whole hemisphere so you can look left and right, up and down. The immersive effect is complete, especially given that most people seldom look behind them when viewing 360 content. I’m no expert. But I muddle though by using my smartphone (Android) to view the video. But I have to tap the little “headset” icon down at the bottom to get the double image that gives the immersive effect when using a headset. BTW I’m very reluctant to commit much $ on this yet. So I use this very simple, inexpensive viewer http://a.co/i2vkKaW. Seems to work and gives me the basic idea. I’m curious which VR Headset you use? (The Economical One you mentioned that costs a little over $100) Is that the one that displays 4K that you mentioned before? The one I use is the X-Gody V-05 and it cost about $125 postpaid. The VR Sky use to sell for about ninety bucks postpaid but these seem to have been discontinued. Just taking a quick look at eBay, there’s a Shinecon at around the same price I paid with just about the same features. But those are all 1080p. There is an XGody 2K at $190. and then the only 4K model I know is the Pimax 4K at a little over $300. I wanted to get a low priced one just to see what these headsets were all about. And based on what I have found, I am not sure I want to spend any more even if higher priced ones are higher resolution. As with VR180 cameras, I prefer to sit back and wait to see if newer products will motivate me to go further with this. Keep in mind that, to get the maximum effect with this or any other 3D camera, you should make sure to have some subject matter at close range. This means “under twenty feet”. With a 180 3D camera, you can actually come very close – even just a couple of feet away without any worries about cutting off any part of your subject. I suspect lenses on such cameras are fixed focus so make sure to check how close one can get before the image starts to go blurry. But there should be no problem at five feet and beyond. Thanks. I agree after watching some other 180 3D videos. My subjects should be around five feet away and should have items to give it depth. Which I think is important… otherwise why do 3D. Looking at such clips on a monitor is exactly what’s misleading about them because the image is displayed in its entirety, not magnified and viewed from a distance. But VR180 exists for the sole purpose of viewing in a headset and that’s where the effective resolution drops down so markedly. In a headset, I definitely don’t see even 720p from any of the 180 clips I have looked at so far. And anyhow, that’s quite far from the 5.7K that the publicity suggests and that people with a limited knowledge of the medium expect to see in a headset when they hear the term. Hi Francois . With Google VR180, when viewing on a monitor, the image is not shown in its entirety. Anyway i posted a screenshot so you can see what i see on my monitor. We are talking two different things. What I am saying is that when the stereo pair is displayed on a monitor, the image appears in its entirety and thus the resolution is high. But when that same image is viewed in a headset, only a small portion of it is shown at one time and that portion is then substantially magnified so that the resolution ends up much lower. I know that the 2D version is not the full image as I pointed that out myself in reference to the image that appears on the LCD display of the Horizon. But it is still a good portion of it and it is viewed at a distance and not magnified. My point is that one cannot judge the effective resolution by what comes up on a computer monitor but by what is seen in the headset since VR180 cameras are designed specifically for headset use. The 2D image appearing on a monitor that Google appears to feel is a great idea may very well keep people from realizing that there is VR180 content hiding behind it.